Sorghum (Sorghum bicolor [L.] Moench) is a major food, feed, and fiber crop of northeast African origin. It is considered the world's fifth most important cereal. In the United States sorghum grain is primarily a feed crop, while in Africa, Asia, and parts of Latin America its primary use is as a food. The United States accounts for about 9 percent of the world's sorghum acreage and 25 percent of grain produced. Kansas, Nebraska, and Texas yield about 80 percent of the sorghum produced in the United States. Modern grain sorghum is a product of human ingenuity. Cultivated sorghum has morphologically distinct, genetically diverse races that can be intercrossed. The species is a self-pollinating perennial that is grown in temperate areas as an annual, but it is handled as a cross-pollinating crop for hybrid production. Sorghum is especially useful in areas too hot and too dry for crops such as corn. It is classified into four groups: grain sorghum, which includes old types such as kafir, milo, and feterita, as well as dwarf combine-type hybrids grown primarily for grain; forage sorghum, which are types grown primarily for forage, silage, or molasses; grass sorghum, types grown for hay and pasture; and broom corn, which possess long, stiff panicle branches that are used to make brooms. Identification of cytoplasmic-genetic male sterility in the 1950s led to development of grain, forage, and grass hybrids. Grain sorghum hybrids are of a plant height suitable for combine harvest. The grain may be processed in several ways depending on use as a feed (cattle, poultry, or swine) or food. Forage type hybrids often contain high stalk sugar and are used as silage. Grass or grazing hybrids are fine leaved, thin stemmed, and used primarily for grazing, green-chop, hay, or green manure. Grain yield of sorghum has more than tripled since hybrids became commercially available in 1956. The dramatic increase in grain yield may be attributed to improved plant genetics– causing significant improvements in adaptation, maturity, stalk quality, insect resistance, disease resistance, grain quality, and drought tolerance–and improved management, including herbicides, fertilizer, irrigation, and soil and water conservation practices. Sorghum may be rotated with other crops–for example, a sorghum-fallow-wheat rotation or cotton-sorghum rotation depending on the location. More sorghum is grown dryland than irrigated. Sorghum produces excellent irrigated yields, although irrigated acreage has declined as producers shift production to higher value crops. Sorghum acreage declined from 18.3 million acres in 1983 to 9.4 million acres in 1998. Declines have been particularly marked in Kansas. 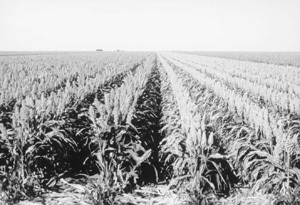 Primary factors are the 1985 Farm Bill, which placed sorghum at a comparative disadvantage relative to corn, and improvements in corn drought tolerance that enabled corn to move into marginal production regions traditionally planted in sorghum. However, no other crop has the versatility of sorghum for diverse production systems, range of planting dates, and maturity. Producers turn to sorghum when other crops fail due to drought or other factors and sorghum will remain key to Great Plains crop production in the twenty-first century. Bennett, William F., Billy B. Tucker, and A. Bruce Maunder. Modern Grain Sorghum Production. Ames: Iowa State University Press, 1990. Doggett, H. Sorghum. New York: Longman Scientific and Technical, 1988.